The ants that we see day to day are adult ants. 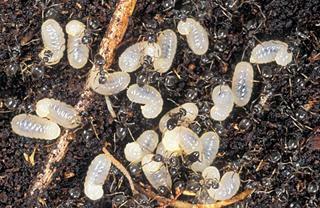 Immature ants or “brood” are usually a whitish color and somewhat resemble fly maggots. They are found inside the nest where they are tended by adult workers. Adult ants do not grow. Some ant species have may have individuals of different sizes. So, if you see “small” ants, they do not “grow up” into larger-sized ones. Ants, as do all insects, have three body divisions: head, thorax, and abdomen. The thorax (middle section) is the part where the legs and wings (if present) are attached. An ant’s thorax and abdomen are joined by one or two segments called nodes, which form the petiole or pedicel. This petiole is one of the important features used to identify different ant species. Seeing winged ants inside your home often means that you have an indoor nest and it may cause alarm because winged ants are often mistaken for winged termites. Here are some features that can be used to distinguish between the two. Figure 1a. 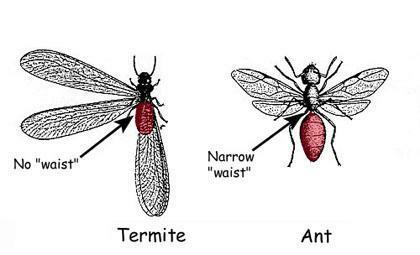 Termites have no waist; ants have a narrow waist. Figure 1b. 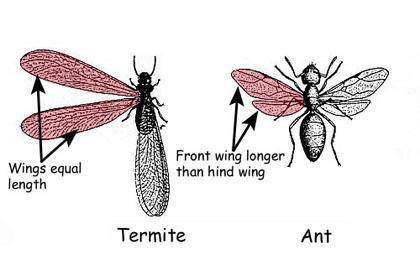 Termites have wings of equal length; ants have a front wing that's larger than the hind wing. Figure 1c. 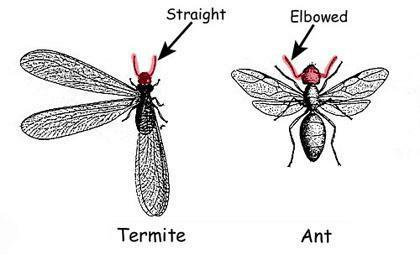 Termites have straight antennae; ants have bent or elbowed antennae. Ants are social insects - they live in colonies that contain three castes or groups: workers, queens, and males. Most of the ants you find in a colony are the workers, which are sterile females. They are responsible for gathering food, feeding the brood (Figure 2) and queen(s), and maintaining and defending the nest. Most ant species produce winged males and females during certain times of the year. These winged individuals, called "swarmers", leave the nest to mate and start new colonies. After mating, the males die and the females (queens) search for suitable locations to start new colonies. The queen sheds her wings and starts laying eggs that will hatch into the legless, grub-like larvae. The queen takes care of these larvae as they develop until finally they become pupae. Within a few weeks, adult worker ants emerge from these pupae and take over the job of tending the young. At this point, the queen’s primary job becomes lay more eggs, although she may help feed and groom the larvae. Some ant species, such as the Argentine ant, do not leave the nest to mate. With these species, new colonies form by “budding” - where one or more queens, along with some workers and young, break away from the main colony and move to a new location. Ant species that reproduce by budding usually do not have permanent nests. If conditions become unfavorable or if the nest is disturbed, the ants will simply move to a new location. This behavior may make it more difficult for you to find and eliminate a nest. Other ants that reproduce by budding include the odorous house ant and the pharaoh ant. In addition, some ant species have colonies that contain a single queen while other ant colonies may contain several queens. These ants may be more difficult to control because eliminating a single queen (or even a few queens) may not eliminate the colony and it may be easier for them to split up and form several colonies near each other. Ants invade homes and other structures in search of food, water, and shelter. Therefore, effective ant management needs to be a combination of control methods that involve inspection, sanitation and exclusion, habitat modification, and often some type(s) of insecticides. Some ant species may require special management considerations which are presented in the section below entitled Specific House-Invading Ants. If you are having difficulty controlling an ant problem in your home, it may be helpful to collect a few specimens for proper identification. Please visit the NCSU Plant Disease and Insect Clinic’s website for information about submitting ants for identification. It is important to check carefully and thoroughly both indoors and outside to determine areas of ant activity, nest locations, and type of ant present. 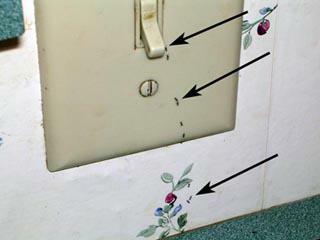 Indoors, follow ant trails to locate their entry point such as an electrical outlet (Figure 4) or gap along a baseboard or around a water pipe. 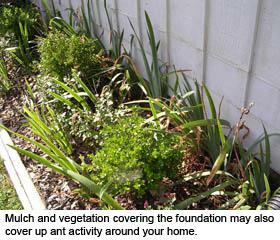 Outside, check the foundation, walkways, trees and shrubs, and in mulched areas for ant trails. Look for nests in mulch and vegetation next to the foundation. Check under potted plants, patio blocks, and stepping stones, and in piles of rocks, lumber, and firewood. Inspect the foundation to find possible ant entryways such as areas where pipes enter the building, foundation cracks, and around doors and windows. If swarmers were found indoors, then you could very easily have an indoor infestation, e.g., in a wall void, in the crawlspace or in the ceiling. In those situations, a careful inspection of the crawlspace may also be needed. Figure 4. Ants trailing to and from an electrical switch or outlet may indicate that they are nesting in the wall. “Habitat modification” involves landscaping and other activities that can reduce the likelihood of ants nesting in areas in the immediate area around your home. For example mulch often provides an excellent nesting habitat for many ants. It provides shelter, warmth, moisture and it can prevent pesticide sprays from reaching their intended target. Keep mulch, leaf litter and vegetation 10-12 inches away from the house foundation. Store piles of lumber, firewood, bricks, and stones away from the house. Many ants are attracted to the sweet plant secretions and fruits/berries of ornamental trees and shrubs. Ants also feed on “honeydew” (Figure 5) – a sugary material secreted by aphids and other insects often found on ornamentals. Place a band of sticky material, such as petroleum jelly or tape, around the base of trees to trap ants. Trim back any tree branches or shrubs that are touching the house so that ants cannot use them to get around pesticide treated areas and enter your home (Figure 6). Controlling honeydew-producing insects on ornamental trees and shrubs will help reduce ant food sources. Figure 5. 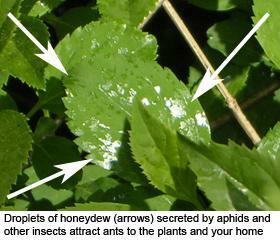 Droplets of honeydew (arrows) secreted by aphids and other insects attract ants to the plants and your home. Figure 6. Mulch and vegetation covering the foundation may also cover up ant activity around your home. Simply spraying the foraging ants you see may bring temporary relief but it often fails to provide long-term, effective control. The workers you see are just a small portion of the overall colony; which often contains thousands of other worker ants, along with the egg-laying queen(s). The most effective ant control is accomplished by locating and destroying the nest(s). Outdoors, check under and among stones, boards, firewood, landscape timbers, logs, stumps, and other debris. Check in mulched areas and in vegetation around the foundation. Sometimes the nest can be found by following the foraging workers back to the nest site. One way to help track ants is to place a sugary food (e.g., bottle caps filled with some soda, peanut butter, or honey) along the outside of your house and check them for ant activity. You should find an active “foraging trail” set up at one or more of the foods and you can follow the ants back to their nest. Once the nest is found you can spray ir drench it with a ready-to-use insecticidal spray (Figure 8) or use a granular bait or granular insecticide if you prefer. 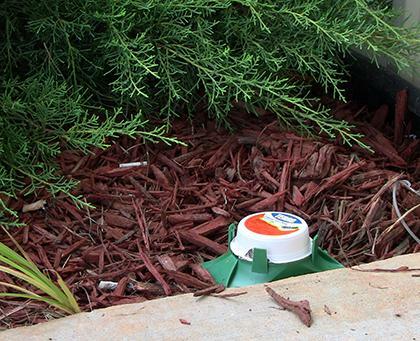 You can also use an outdoor bait station (Figure 9) where ants can enter, collect food and take it back to the nest. You can find a list of commonly used pesticides in the North Carolina Agricultural Chemicals Manual. Always read and follow the product label directions. Locating an ant nest can often be difficult or even sometimes impossible. You can apply an insecticide outdoors to help reduce ant populations and possibly keep ants from invading your home. Outside, treat any known or suspected ant entryways: cracks in bricks and foundations, around crawl space doors, foundation vents and utility openings, and up underneath siding. Place a protective “barrier” around your home by applying a spray insecticide up and around the foundation (Figure 7). The spray should penetrate the soil, not simply lightly coat the surface. Otherwise, it will dissipate too quickly to provide any effective control. The best method of application for homeowners is a garden hose attachment. Treat a 2-5 foot wide area of ground along the foundation in mulched, ornamental plant beds and grassy areas, as well as an 18-24 inch wide vertical band up the foundation wall. Spraying higher up on the house, around soffits, overhangs, and windows is not as important and you need to be very careful when spraying overhead because the chemical will drift down onto you. Remember also to keep children and pets away from treated areas until the chemical dries (or longer if specified so on the product label). Also, watch out for pesticide drifting and contaminating toys, swimming pools, and other objects, such as barbecue grills, etc. 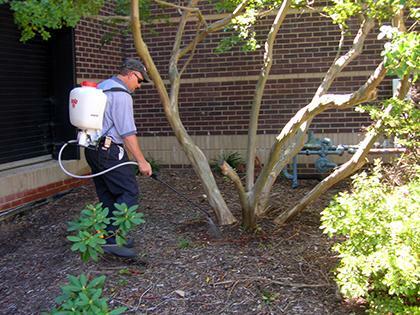 Granular insecticides can be used in the place of sprays to treat the soil around the home. Do not apply granular insecticides if the grass is wet from rain or dew because insecticide granules will get hung up on the vegetation. The treated area should be watered lightly to ensure that the insecticide is released into the soil. If ant activity continues or even increases indoors following a perimeter treatment, it is possible that ants are nesting indoors or in the crawlspace and were “trapped” by your treatment. This can help you narrow down your search for the nest. Spraying indoors to control ants is often ineffective in the long term particularly with repellent insecticides because these treatments may only “detour” the ants from the treated area and doesn’t stop them entirely. Indoors, focus on sanitation, exclusion, and baiting. For additional information, visit Tips for Effective Ant Baiting. Figure 7. Applying an insecticide barrier to the perimeter of a house. 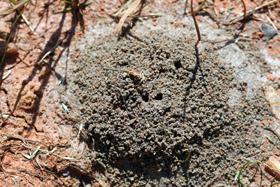 Figure 8 - Treating around the base of a treat where an ant nest is located (Image - M. Waldvogel, NCSU). Figure 9 - An outdoor bait station can intercept ants. (Image - M. Waldvogel, NCSU). 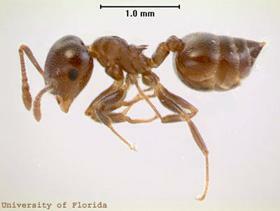 The odorous house ant (Figure 10) is probably the most common house-infesting ant species in North Carolina. Their name comes from the odor similar to rotten coconut that is noticeable when you crush them. Workers are about 1⁄8-inch long and brown to black in color. There is one node on the pedicel that is hidden by the overlapping abdomen (see the picture above). Colonies may contain several hundred to 100,000 workers and contain multiple queens. New colonies are formed primarily by budding; however, occasional mating swarms may occur in late spring. Odorous house ants can nest in many different places. Outdoor they may build their nests in mulch, in piles of logs, firewood, boards, and other debris. They may also nest beneath stones, sidewalks, patio blocks, and concrete slabs. Indoor nest sites may include wall voids, window frames, in insulation in an attic or between bats of insulation and crawlspace subflooring. Indoors, odorous house the ants are typically attracted to sugary food items. Outdoors, they feed on the honeydew secreted by aphids and other insects on shrubs and trees. If possible, locate and destroy the nest(s). If the nest(s) cannot be found, baiting may be required for successful management. Conduct a thorough inspection inside and out to determine areas of ant activity. Place bait in known and suspected foraging areas. Odorous house ants prefer sweets; therefore, for best results use a sugar-based bait such as Terro. Please read the information on baiting in the Management section above for optimum results. Try to determine where ants are entering the home and close off or treat those areas with an insecticide. Manage honeydew-producing insects on ornamental trees and shrubs. Argentine ant workers are approximately 1⁄8-inch long and light to dark brown in color (Figure 11). There is one visible node present on the pedicel. Originally from South America, this ant is believed to have entered the US on coffee ships from Brazil and was first recorded in Louisiana in 1891. Since its introduction, the Argentine ant has become established throughout the southern states and in California. Colonies contain multiple queens and are large and expansive, consisting of many nests. Unlike many ant species, members of different Argentine ant colonies are not aggressive toward one another and mix freely among nests, permitting colonies to grow to enormous sizes. Mulch is a perfect nesting substrate for this ant. During the summer, nests located in soil are usually very shallow, only 1-2 inches deep. Nests may be found in all types of piled items, including lumber, rocks, and other debris. Wall voids, insulation, and bath traps may serve as nest sites for this ant. Argentine ants feed on both live and dead insects, as well as honeydew. They may be attracted indoors by many food types, but prefer sweet foods. Find and destroy as many nests as possible. This may be easier said than done however, because of the large, extended colonies that are usually present with this species. Therefore, place baits in ant activity areas to indirectly target those nests that cannot be located or accessed. As Argentine ants prefer sweets, use a sugar-based bait such as Terro for best results. Please read the information on baiting in the Management section above for baiting tips. Seal up any openings that Argentine ants may be sing to get indoors. Potential ant entryways may also be treated with a residual insecticide. Treat ornamental trees and shrubs for honeydew-producing insects. Little black ant workers are very small, about 1⁄16-inch, shiny black in color, and slow-moving (Figure 12). There are two nodes present on the pedicel. Colonies are moderate to large and contain multiple queens. New colonies are formed by swarmers which are typically seen June to August. This ant may nest in many different places, including in mulch, logs, stumps, and in piled items. Little black ants may invade homes in search of a wide variety of foods including sweets, meats, grease, and bread. Outdoors, this ant feeds on insects, honeydew, pollen, and sweet plant secretions. Little black ants travel along defined foraging trails and are slow-moving. Therefore, workers can easily be followed back to the nest. Once the nest is located, it can then be destroyed. Seal up any openings that ants may be using to get inside. If nest(s) cannot be found, apply baits both indoors and out. Workers are slow-moving, 1⁄10-inch to 1⁄8-inch long, and dark brown in color (Figure 13). Both the head and thorax have numerous grooves that run lengthwise. In addition, there is a pair of spines on the thorax and a sting at the tip of the abdomen. As their name implies, pavement ants tend to nest beside and under sidewalks, driveways, patios, and foundations (Figure 14). The presence of a nest is often evidenced by a mound of soil around a crack in pavement. Winged reproductive ants undergo mating flights in the spring to form new colonies. Pavement ants feed on dead insects and honeydew. Indoors, they feed on most types of food, including both sweet and greasy items. 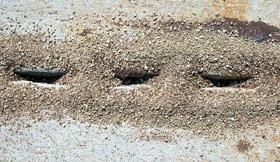 Sweep granular insecticides into cracks under slabs and sidewalks where pavement ants are nesting. Alternatively, flood the cracks with an insecticidal spray (don’t spray these areas if you bait them). Apply bait where ants have been seen foraging. Both sweet and protein foods are attractive to pavement ants. 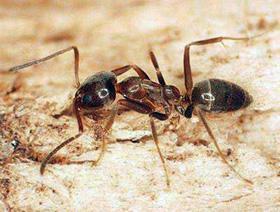 Acrobat ant workers are 1⁄16- to 1⁄8-inch long and light brown to black in color (Figure 15). There is a pair of spines on the thorax and the abdomen is heart-shaped when viewed from above. 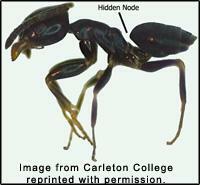 This ant gets its name from the fact that it raises its abdomen over its head and thorax when alarmed. Acrobat ants nest indoors where moist, damaged wood is present (Figure 16). Therefore, their presence in structures often means a moisture problem or water leak is present. 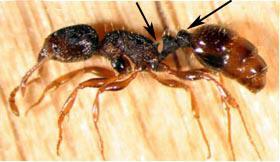 In addition, this ant will nest in abandoned termite, carpenter ant, or other wood-destroying insect nests. Acrobat ants may also nest in Styrofoam insulation panels and wall voids. Often, this indoor nest is associated with a nest outdoors in a tree, stump, or log. Workers feed on live and dead insects, as well as honeydew from aphids and mealybugs. 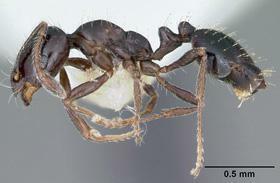 This ant may invade homes in search of household food, showing a preference for sweets. When colonies are disturbed, workers will readily bite and emit a repulsive odor. New colonies are formed by swarmers that take flight from mid-May to September. Nests within damaged wood can be treated by injecting insecticidal sprays or dusts into the nest. Such a treatment may require drilling small holes be drilled into the affected area. However, control will be most effective if damaged wood is replaced and moisture problems are corrected. Ants invading the home from outdoor areas can be managed by sealing cracks or other openings in the foundation. 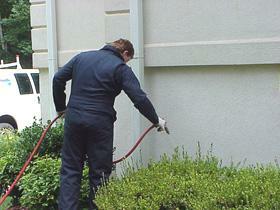 An insecticidal barrier may also be applied around the perimeter of the home. Check that doors and windows fit properly; install weather stripping where needed. Spot treatments around areas where power lines enter the home can be effective. Treat ornamental trees and shrubs for honeydew-producing insects. Figure 10. Odorous house ant. Figure 12. Little black ant. Figure 14. Pavement ant nests. Figure 16. 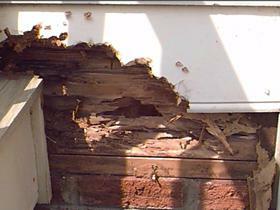 Damaged wood next to a house can invite ants.